It’s the wonder salt that isn’t even a salt! Magnesium sulfate is the true name for epsom salt: it’s a mineral compound containing magnesium, sulfur and oxygen. Well, that doesn’t tell us much unless you’re into chemistry, so let’s move on to some fabulous things you can do with epsom salt. We’ve all heard that it’s great to pour some into a bath, to relax tired, aching muscles (but in case you haven’t, add 2 cups of epsom salt to a warm bath and enjoy!) What else? Slugs and racoons hate it – sprinkle some where they tend to wander and they’ll stay away. Don’t forget to reapply after a rainy day! It will help fertilize your plants and green up your lawn – check out the list from Epsom Salt Council of the many ways you can use it, with directions for each! It’s good for houseplants, lawns, shrubbery, trees, fruit trees, roses and more. Use it as an exfoliant for your skin in the shower. Scrub from top to bottom and rinse thoroughly. If you want to get fancy with it, make your own lavender coconut body scrub! Get your feet flip flop ready with this magnesium foot scrub recipe: mix a cup of epsom salt with ¼ cup of olive or almond oil, a teaspoon of liquid castille / oil based liquid soap (optional) and 10-15 drops of essential oils (also optional). Scrub your feet with about a teaspoon worth of your mixture at a time and rinse. Volumize fine hair by combining equal parts warm conditioner and epsom salt. Work it into your hair and leave it on for 20 minutes. Rinse thoroughly. Help draw out splinters – soak the hand or foot with the splinter in an epsom salt solution. The salt will reduce the inflammation around the splinter and soften it up, making it easier to remove. You can also use it to make a paste to apply directly to the area affected by a splinter: one teaspoon of epsom salt, dissolved in a cup of hot water. Chill in the fridge for at least 20 minutes before applying. Ease the itch of bug bites by combining a tablespoon of epsom salt to ½ a cup of hot water, to dissolve. Then you can spritz on the mixture or dab with a wet compress to take away the itch and sting of summer biters. Use ¼ tablespoon and warm water to scrub pots and pans that have been burnt. Clean bathroom and kitchen tiles with it – mix equal parts epsom salt and liquid dish soap, dab onto offending areas and let is soak for a few minutes, then scrub away the grime! Okay, perhaps not the bag of it you bought at the store, but you can make gorgeous Salt and Olive Oil scrub or a beautifully hued lavender bath salt, which will beat out the overpriced bath salts you can buy any day of the week! These are so versatile and useful, throughout your house and home. Stock up on some and let me know how you use epsom salt! You might also like this post about vaseline uses or coconut oil uses. I like all these ways to use Epsom salt. I want to make the body scrub and use it to exfoliate my skin. I also like like that I can use it in the kitchen. I did not know that I can clean scrub my pots and pans that have been burnt. Wow, I never realized there were so many uses for it! Never heard about using them in the garden. I often put them in the bath but that is about it, will have to use them for more things! Okay, an Epsom Salt Council? Didn’t know that, and totally want to try it for easing the itch of bug bites next summer! Wow I didn’t know some of this stuff. I currently use it in my bath for pain. Great garden tip, I don’t think I’ve used Epsom Salt for much before, definitely will have to try this come spring! Wow this gives me a much better idea why Mom always uses the stuff! I cannot even imagine life without espsom salt. Great tips. I always use Epson salts in the bath salts I make and give for gifts. 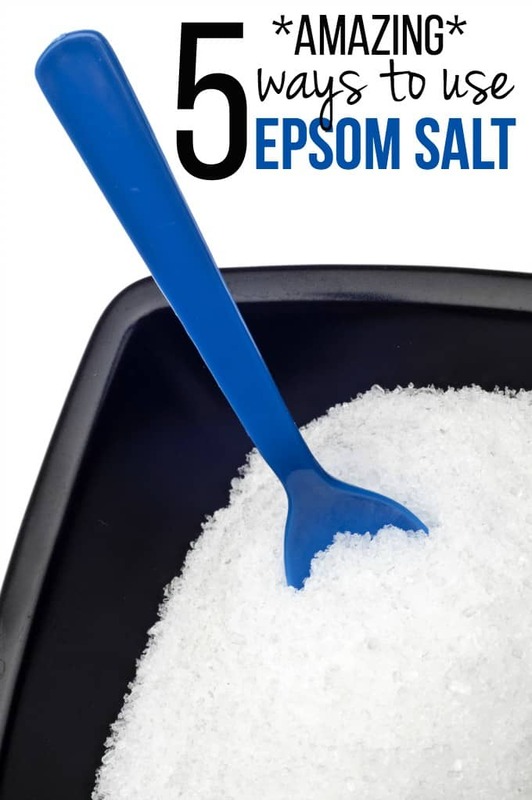 Some of these ways to use Epsom Salt I never would have thought of. Great article. I often use it in my bath. Never knew about raccoons not liking it! Thanks for sharing these tips,i will try it in the garden come Spring! OOPs – that was not ready to submit. I like the recipes. I did a lavender bath salt many years ago for a trade your product fair in grade school. Mine sold out! This is the best simple yet sweet homemade gift idea. I have only used Epsom Salts to soak my husband’s feet once a month. He is disabled and I give him a pedicure after a good soak. I was not aware that Epsom Salts had other uses. Thank you so much for this information.